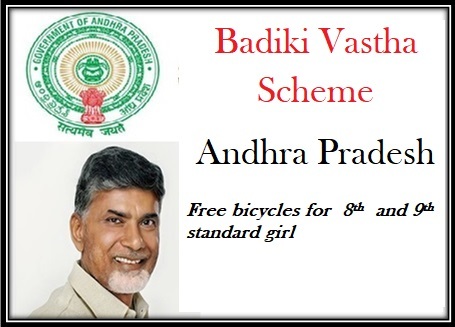 To encourage girls’ education in the state, the Andhra Pradesh State Government has started a new scheme namely Badiki Vastha Scheme. Under this scheme school going girls will get bicycles from the state government. This scheme has been launched so that girls attend schools on regular basis. The scheme was originally launched in last academic year 2017-18. At that time, the CM of the state has declared that only 9th standard students will get the cycles. This year, in 2018-19, the scheme has expanded, according to the CM. Now, students from 8th standard will also be eligible to receive cycles from the government. In Guntur, Andhra Pradesh, the CM has announced about the expansion of the scheme on 30th May 2018. Objective: The main reason behind expanding the scheme is to reduce the school dropouts in the state. Girl students are dropping out from school at very early age. The scheme will help them to reach school on time. Beneficiaries: According to the reports, there are more than 1.5 Lac students are studying in 8th standard under this scheme. On the other, nearly 1.5 Lac students are from 9th standard will be able to receive benefits under the scheme. In this academic year nearly 3 Lac students will be beneficiaries under Badiki Vastha Scheme. Implementation: The scheme has already implemented in the last academic year. Unfortunately it wasn’t properly done. Among Lac of students only 50, 000 students in a year received cycles from the State Education Department. This year, according to the reports, 3 Lac students will get the cycles in coming academic year. Budget Allocation: Last year the state has allocated Rs. 75 Cr in total for the scheme. This year none of the reports on budget has been come out yet. The scheme was started for the girl children. Students who are unable to reach school or leave school at early age will be eligible for the scheme. Only 8th and 9th standard students will get the benefits of the scheme started by the Chief Minister of Andhra Pradesh. Schools: Only Government sponsored schools in the state will be considered under the scheme. To encourage the students of government schools to enrol their names the state has started the scheme. Eligible students are needed to contact the principal or the head of the school they are studying to apply for the scheme. Further process will be done through the school officials. As said that the scheme has started last year, the work in progress wasn’t really well by the state. Among 1.80 Lac students only 1 Lac cycles were being distributed among students. On the other, the website shows only 50,000 photos of the students receiving the cycles from the state department. Overall the scheme wasn’t as successful as promised last year. This year the state has focussed on the scheme more so that the state can successfully provide the benefits to all the beneficiaries within a year. According to the officials, students, especially girls, are required to pursuit their studies, at least till class 10. Due to absence of students, most of the high schools are getting merged with other schools. This creates hassles among students and also they are not getting proper education as per their course. Among many initials taken by the states to encourage school education, this is one of the leading schemes in Andhra Pradesh. As per the reports, the state will soon implement this scheme in several schools.